Dr Alan was led into chiropractic by his father, who was a chiropractic patient and saw great success from his treatment. It made Dr Alan realise that he would become a chiropractor too. He attended Palmer College of Chiropractic in the US, since there was no chiropractic college in New Zealand at that time. 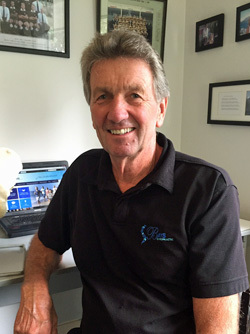 Dr Alan has been offering chiropractic at the same location since 1972, back when North Shore was still a farm. He has also taught at the New Zealand College of Chiropractic, helping future chiropractors become educated on how to improve the lives of their patients. Dr Alan grew up in the North Shore community and takes advantage of all the area has to offer. He is a keen sportsman and had a rugby scholarship to help him through university in the US. Dr Alan also enjoys being out on his boat and was a New Zealand yachting representative from 1973-1978. He scuba dives, fly fishes and plays golf and tennis. Dr Alan lives in Castor Bay with his wife, Hilary. They have three children and seven grandchildren.